Our new neighbor's little 5 year old son passed away last Thursday and we did not find out about it until he was buried on Monday. He was born with lots of problems and has struggled most of his life. But, my heart breaks for them and I wanted to send them a word of comfort. I kept this card very simple letting the DP be my background and focal point. I punch the corners with my Martha Stewart Loop punches (in stock now) and attached the DP to a 6x6 card using Neenah White Cardstock. Then sentiment is from JustRite's Thinking of You set. I cut it out using the Classic Oval Small Nesties S4112, sponged the edges for a more dramatic appearance and added a heart crystal. On the inside I stamped a verse from Verve and wrote a personal note. Joan, What a beautiful card for such a sad occasion. My heart goes out to them on the loss of their son! 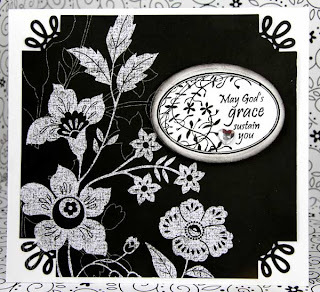 I have always found it very trying to make sympathy cards until I got that set from you! Thanks so much for sharing this! A beautiful card Joan. How sad and heart breaking to lose their little one. I'll keep the family in my prayers. What a beautiful card Joan.. the family is sure to find comfort from it! OMGosh ... how sad!! This is a beautiful card Joan and I'm sure the family will appreciate your kindness! I will definately keep them in my prayers .. I can NOT even imagine the grief they must feel!! Bless you for your kind heart!! Joan..what a nice card..so very sad.. I can't imagine losing such a young child, and their hearts must be broken. Hopefully this beautiful card will uplift them somehow. Beautifully done! !